If you are going to spend time in the Adirondacks, it pays to abide the ancient wisdom suggesting we live in the moment. One way I interpret that bit of advice is, “Pay attention.” I find the busier my schedule is however, the more difficult it is to actually pay attention and not switch to hurry-up, auto mode. I can tell I am getting better at this though. Despite the busy schedule I've been keeping lately, I think I’ve done a good job of paying attention. Living in the Adirondacks will do this for you. 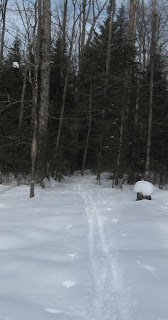 Because I love to ski; skiing is relaxing and exhilarating at the same time, and it makes Adirondack living my personal paradise, I pay attention to the weather. Naturally, this requires living in the moment. The next step however, is where the leap that leads to extreme happiness occurs. Living in the moment these past few days has allowed me to realize the skiing was great right then, and heavy rain was on the way. Who knows what tomorrow may bring? I worked hard to arrange my schedule and made sure I had some awesome ski moments. This leap; from living in the moment to actually seizing the moment, seems to be the point of that ancient adage.